This Emergency Snack Pack recipe was inspired by Thermofit with Noni. 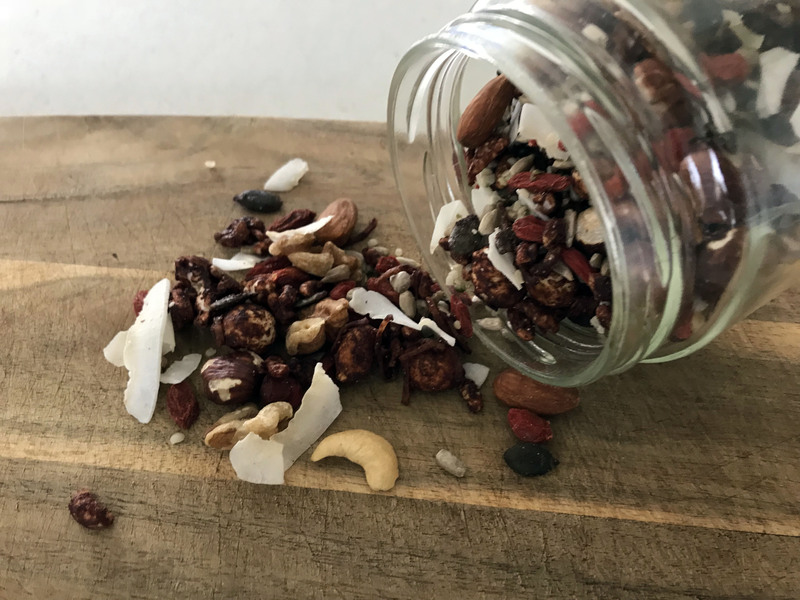 Our beautiful friend Noni shared recently that always keeps a jar of nuts in her car so when she get’s hungry on the road, she always has a healthy snack on hand. I loved this idea because I am positive the kids wait until we’re in the car and been on the road for 10 minutes just to say “Mum, I’m starving” (can you relate?). The handy jar of nuts has come to the rescue a few times since. To minimise the cost of eating wholefoods, I like to ensure my recipes are multi-purpose. This way I can buy one set of ingredients, and use them multiple ways. That’s how this Emergency Snack Pack came about – I combined two of my existing recipes (Seed and Trail Mix plus Chocolate Breakfast Puffs). Make this up, pop it in a jar and leave it in the car or your handbag. I have a 6 hour solo road trip coming up, so this emergency snack pack will be sitting on the passenger seat ready for when my tummy rumbles. Note – I added a few handfuls of mixed natural nuts to this mix too. After I made it all, I also added in some hemp seeds. Mix all the ingredients except raisins and cinnamon in a bowl then spread out on the baking tray. Sprinkle the cinnamon if you’re adding it. Bake in the oven for 5-8 minutes until golden. Remove from heat and allow to cool before storing. When both the trail mix and the chocolate puffs have cooled, pop them both in a big bow and mix together. Then store in glass jars. I encourage you to keep one for your desk too. Just a reminder, you don’t need to be a master chef, or have a big spotless kitchen to make awesome nutritious meals or snacks for your family. We buy most of our pantry staples from The Wholefood Collective. We love them. Please do check them out. If you purchase from the link above then you get the same great price but the The Wholefood Collective will also send us a small financial thank you – this helps us to continue to keep providing you with loads of free recipes, tips and educational articles. We thank you for supporting us by shopping using these links.